This bibliography features Chinese heritage literature for children and young adults. The intent is not to be comprehensive but rather to highlight. THE AGENCY: A SPY IN THE HOUSE by Y.S. Lee (Candlewick, 2010). At age eleven, in 1850s London, orphan (and thief) Mary Quinn was rescued from the gallows by agents of Miss Scrimshaw’s Academy for Girls. For the next six years, she studied all that was expected of a proper Victorian lady (and more). And now, at seventeen, she’s invited to join The Agency, a secret organization of women investigators whose mandate is to assist Scotland Yard. With her background in Victorian literature and culture, Y.S. Lee provides texture and pungency without overshadowing the characters or plots. Ages 12-up. Recommendation by Greg Leitich Smith. Read The Story Behind The Story by Y.S. Lee. THE AMAH by Laurence Yep (Putnam, 1999). Amy Chin is a dedicated young ballerina forced to sacrifice her dancing to care for her young siblings when her mother is hired as an amah (nanny). Stephanie, her mother’s charge, seems to be taking everything away and, at the same time, embarassing Amy with extravagant gifts. Ages 8-up. APPLE PIE 4TH OF JULY by Janet S. Wong, illustrated by Margaret Chodos-Irvine (Harcourt, 2002). A young girl whose parents own a Chinese restaurant ponders the appropriateness of Chinese food versus Apple Pie on the 4th of July. Ages 4-up. AT THE BEACH by Huy Voun Lee (Henry Holt, 1994). Xiao Ming learns to write Chinese (Mandarin) by writing in the sand and comparing the characters to various sights around her. An American Bookseller Pick of the Lists. Ages 4-up. COOLIES by Yin, illustrated by Chris Soentpiet (Philomel, 2001). Framed as a family story, this exquisitely illustrated picture book tells of the Chinese immigrants who helped build a great railroad across the western United States. The story does not romanticize the conditions or treatment the workers endured, but it does celebrate their bravery, tenacity, and accomplishments. Ages 5-up. EARTHQUAKE by Milly Lee, illustrated by Yangsook Choi (FSG, 2001). A Chinese American girl tells the story of her family during fallout from the San Francisco earthquake of 1906. Based on a real family story. Excellent author’s note. Ages 4-up. EL CHINO by Allen Say (Houghton Mifflin, 1990). An inspiring picture book biography of Bon Way “Billy” Wong, the first Chinese American bullfighter—a young man raised in Arizona who found his dream in Spain. Ages 4-up. More on this title from Cynsations. 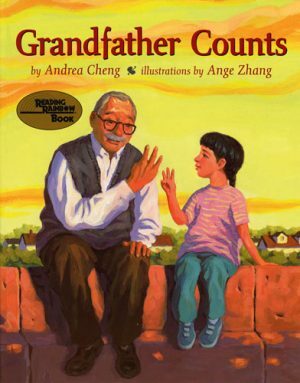 GRANDFATHER COUNTS by Andrea Cheng, illustrated by Ange Zhang (Lee & Low, 2000). When Gong Gong (grandfather) first comes to live with Helen, she feels distanced by his inability to speak English and her inability to speak Chinese. Then, watching a train together, they begin to teach each other how to count the cars, Helen in English and Gong Gong in Chinese. In time, the two begin to bond as grandparent to child. A realistic, warm book that is not overly sentimental. Ages 4-up. HANNAH IS MY NAME by Belle Yang (Candlewick, 2004). Hannah and her family are so excited to immigrate to the United States, to become Americans, to be free. But how scary and worrisome it is to wait to see if they will be sent green cards so they may stay legally and make San Francisco their home. Joyful, vibrant, and optimistic without minimizing the challenges faced by newcomers. Ages 4-up. THE MAGIC HORSE OF HAN GAN by Chen Jiang Hong (Enchanted Lion, 2006)(originally published in French as Le Cheval magique de Han Gan (2004)). A look into the life of painter Han Gan, who lived in China 1,200 ears ago, that incorporates a legend about one of the horses in his paintings coming to life. It’s always a high burden to offer art reflecting a great artist, but Hong more than succeeds. Magical, indeed, with an underlying theme of the relationship between art and peace. Ages 6-up. 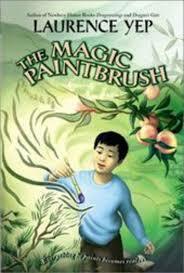 THE MAGIC PAINTBRUSH by Laurence Yep (HarperCollins, 2000). This historical novel centers on young Steve, Grandfather, and a friend of the family, Uncle Fong. After the tragic death of his parents, Steve comes to live in Chinatown with his poor Grandfather, who seems emotionally distant. When Grandfather gives Steve a magic paintbrush, suddenly they can paint their desires into reality. Probably my favorite book by Yep. Characterization is particularly wonderful. Ages 9-up. MEI-MEI LOVES THE MORNING by Margaret Holloway Tsubakiyama, illustrated by Cornelius Van Wright and Ying-Hwa Hu (Whitman, 1999). Illustrated in beautiful watercolors, this book is a slice-of-life celebration of the loving relationship between Mei-Mei and her grandfather. Ages 4-up. 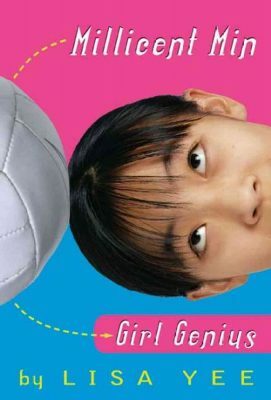 MILLICENT MIN, GIRL GENIUS by Lisa Yee (Arthur A. Levine, 2003). Millicent Min is (1) just about the enter her senior year in high school, (2) has no friends, and (3) is resented by other kids because she sets the grading curve. She’s also eleven, which might have something to do with at least (1) and (3). Because of (2), Millie’s parents sign her up for summer volleyball and make her tutor her mortal enemy… A dry, funny first novel. Ages 9-up. Look for more books from the series. AN OCEAN APART, A WORLD AWAY by Lensey Namioka (Delacorte, 2002). Xueyan, called Yanyan, is an excellent student at her missionary school in 1911 China, and she wants to study medicine. Yet it’s an unusual occupation for a woman of her day, even one with no interest in marriage like Yanyan. Will karate-expert and scholar Baoshu change her mind or will Yanyan find her place and excel in her studies in another country, America? Companion book to TIES THAT BIND, TIES THAT BREAK. Ages 12-up. 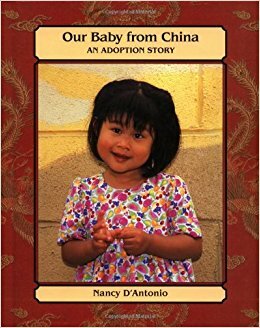 OUR BABY FROM CHINA: AN ADOPTION STORY by Nancy D’Antonio (Whitman, 1997). A photoessay of the author and her husband’s journey to China to adopt their daughter, Ariela Xiangwei. Ages 4-up. SAM AND THE LUCKY MONEY by Karen Chinn, illustrated by Cornelius Van Wright and Ying-Hwa Hu (Lee & Low, 1995). Sam is all ready to spend his money in Chinatown. But maybe buying a thing isn’t the best way to use it. Ages 4-up. SIX WORDS, MANY TURTLES, AND THREE DAYS IN HONG KONG by Patricia McMahon with photographs by Susan G. Drinker (Houghton Mifflin, 1997). This well-written nonfiction account is illustrated in storytelling photographs that convey personality. It chronicles the daily life of Tsz Yan, an eight-year-old Chinese girl living in contemporary Hong Kong. Sensitive, humorous, and stereotype shattering. Ages 8-up. SPLIT IMAGE: A STORY IN POEMS by Mel Glenn (HarperCollins, 2000). Laura Li is a different person to her ashamed mother to her motherly librarian, to her distant father, her friends, the bartender, her rivals, the boys at school. In alternating diverse and compelling voices, Glenn offers another first-rate verse novel to teens. Ages 12-up. 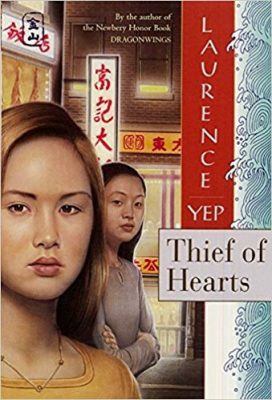 THIEF OF HEARTS by Laurence Yep (HarperCollins, 1995). In this sequel to CHILD OF THE OWL (1977), Stacy is called a “half-breed,” and both her loyalties and identity are challenged when Hong Ch’un moves from China to Stacy’s suburban California school. When Hong Ch’un is accused of stealing, Stacy is forced to carefully consider her own reaction and find out what has really happened. Ages 8-up.